Gator Cases is extending its line of G-TOUR Pedalboard cases to include the new G-TOUR PEDALBOARD-XLGW. This extra-large size pedalboard is the largest in its class, with a 34-inch by 17-inch surface area to store a range of pedals. The G-TOUR extra-large pedalboard case designed by Gator Cases is built for maximum durability and protection. Constructed from heavy-duty wood and aluminium reinforcement around the corners, it is impact-resistant, as well as resistant to water, dust and dirt. With 3M hook and loop fasteners and an ultra-padded interior, each pedal is held securely in place between uses and shielded against scratches and dents. 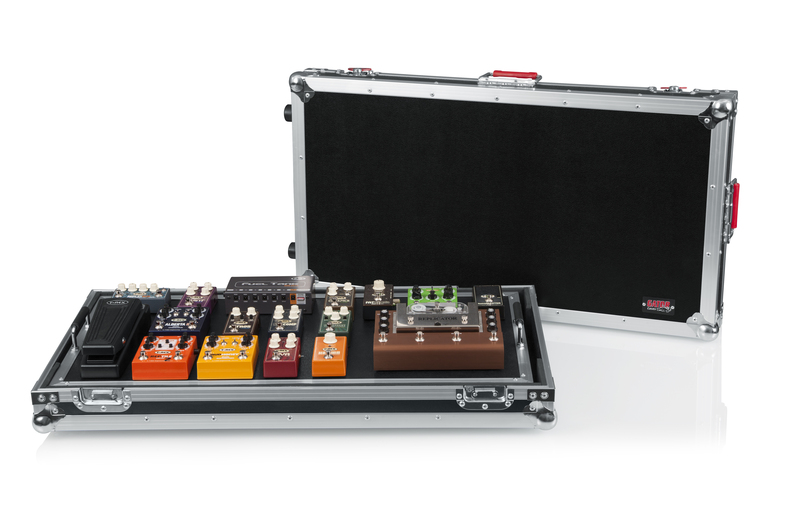 One of the main advantages of the G-TOUR pedalboard case is its removable pedalboard surface. This removable surface has two side handles, allowing musicians to simply lift the board out of the case, revealing a storage compartment underneath for cables and other accessories. This extra-large pedalboard case joins two other sizes – small and large – in the G-TOUR pedalboard series. The series is back by a lifetime warranty from Gator Cases. You can view the new G-TOUR Pedalboard Case XL here HERE.